Here is some information about my home energy storage installation. 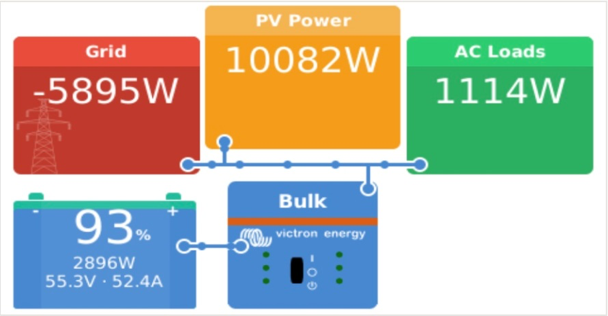 The Victron Energy Hub-4 software in the Victron CCGX optimises the system for solar self-consumption. In the presence of excess solar generation, that energy is applied first to the home loads, the surplus to charging batteries, and the surplus beyond that to export to the grid (if connected). When there is less solar generation than the home loads require, those loads are supported by the solar energy that is available, which is then automatically augmented with battery energy. The grid is used as required to further augment home demands as required (either when the peak load exceeds the battery inverter capacity or when the batteries are fully depleted). The system allows the configuration of an adjustable reserve percentage of the storage battery energy to be kept in the batteries in case of grid failure. It also allows the system to be charge up proactively from the grid in periods of low grid energy cost or ahead of incoming bad weather that might increase the chances of a grid energy failure. The system automatically reverts to off-grid mode if the grid is unavailable, including recharging the batteries from solar energy to help support loads in the home for extended periods during such outages. The performance of the system is very good. On a sunny week, most of our home electrical energy is provided by direct and indirect (battery time-shifted) energy. Of course in weather conditions offering reduced solar energy, more grid energy gets used. Like a home rainwater tank system, this system acts as an electrical energy buffer, doing the best it can to avoid the use of grid energy, and prioritising the use of battery energy first. The system works very well indeed – and flawlessly from the standpoint of my family, who see a house that ‘just works’ – even when the grid doesn’t. 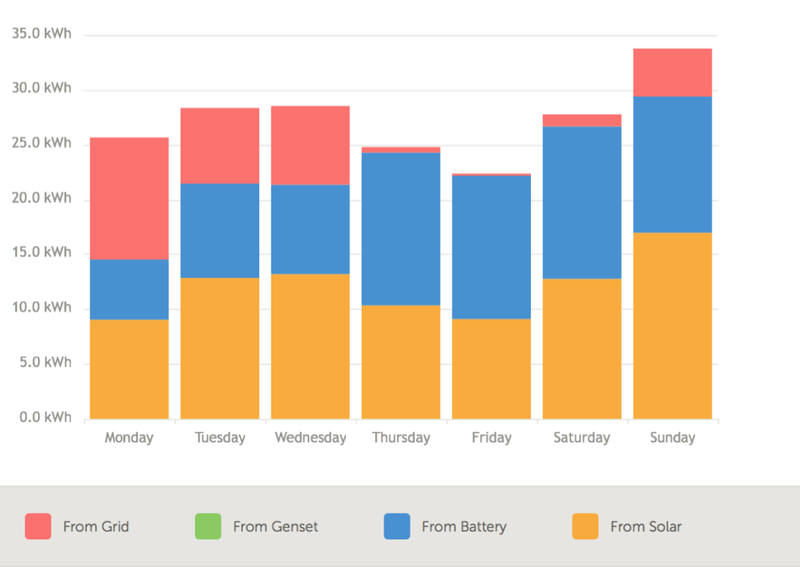 We all appreciate seeing the house operating well into most evenings on time-shifted solar energy harvested during the day. Note that this system doesn’t use Redflow “ZCell” enclosures because it pre-dates the existence of those enclosures. 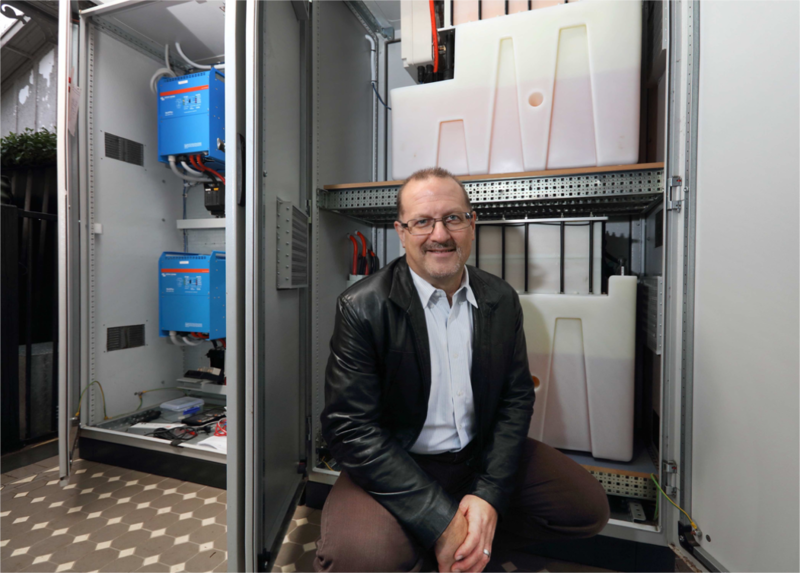 It was one of the earliest production deployments of Redflow batteries in a residential context.